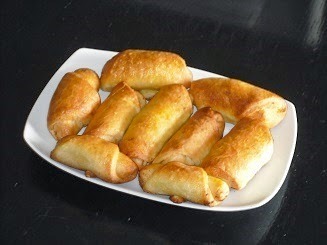 This is a recipe for small Greek cheese pies (Tiropitakia). There are many, many varieties of cheese pies in Greece and the recipe here is for delicious small pies that can be eaten as a snack, a side dish or part of a buffet. Dissolve the yeast and sugar in 200ml tepid water. Put the flour in a large mixing bowl and make a well in the centre. Add the water with the yeast and sugar gradually and mix gradually with the flour. Cover the bowl with cling film and leave in a warm place for 30 min. Add the salt to the dough and enough tepid water to make a pliable dough. Knead the dough well, cover with cling film and leave in a warm place for at least 1 hour, until it has doubled in size. While you are waiting for the dough, prepare the filling - lightly mix the crumbled anthotiro cheese with the melted butter, smoked paprika and basil. Make a ball from the dough approx. the size of a medium orange and leave the remainder of the dough covered. On a floured surface roll out the dough ball into a circle with a diameter of 20cm. Divide the circle into 6 sections as if cutting a pizza. Brush the dough with melted butter and add a tbsp. of the filling to each of the wide ends of the triangular sections. Fold the dough over the filling and keep rolling the dough towards the point of the triangle. Place the 6 pies in a large shallow oven dish with the ‘point’ at the bottom (so it doesn’t open when it swells in the oven). Leave 3cm space between each pie. Repeat the process with the remaining dough and filling – you will probably need 2 oven dishes. Place the butter cubes between the small pies. Make the eggwash by whisking the egg yolk well with the olive oil and water and then brush the tops of the pies with it. Bake in a preheated oven at 180 degrees Celsius (moderate) for about 45 min until they are golden brown.